How do I determine the “publication date” for a thesis? A thesis is generally considered “published” when it has been cataloged and shelved in a publicly accessible library, but other factors could impact the publication date for patent purposes. For example, a thesis submitted electronically might be considered published on the date the electronic version is first made available to the public online, if this occurred prior to the thesis being cataloged. It might also be considered “published” if the student posted a copy on a personal website before submitting the thesis. For further questions, contact the Office of the General Counsel, 617.452.2082. How do I determine the date a thesis was cataloged? The first two digits 06 = year (2006), the next two digits 03=month (March), and the last two digits 09= day (9th). The publication date for the above record is March 9, 2006. Note that the stamped date on the title page is not the thesis publication date. It is the date the thesis was received by the MIT Libraries. 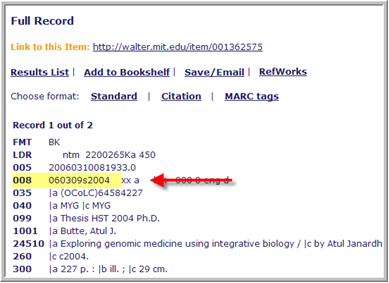 A thesis is considered published when its catalog record is created and made available in Barton, the MIT Libraries catalog. When is a thesis available to the public? Theses are available for public inspection (MIT and non-MIT) on the day they are received in the MIT Libraries, unless there is a hold request on the thesis. Users interested in a thesis not yet in Barton may contact the Institute Archives staff to determine whether the thesis has been deposited. If it has been deposited, and if it is not on hold, the user may view the thesis in the Institute Archives reading room. How long does it take for a thesis to be cataloged and added to DSpace@MIT? The time frame for the deposit, processing and cataloging of theses is a minimum of 3 months following delivery by the department; currently the average time frame is 3-6 months. Theses placed on hold are not cataloged until a release letter has reached the Institute Archives. Theses can be held for a period ranging from three months to a year. How do I request permission to reproduce a portion of thesis X? Can I access a thesis that is not yet available in DSpace or Barton? Users interested in a thesis not yet in Barton may contact the Institute Archives staff to determine whether the thesis has been deposited in the archives. If it has been deposited, and if it is not on hold, the user may view the thesis in the Institute Archives reading room. I am not from MIT. How do I get access to a thesis? How do I print a thesis? MIT theses that have been scanned and deposited into DSpace@MIT are openly accessible to anyone. Each thesis record in DSpace@MIT has a ‘Full printable version’ PDF that can be read, downloaded, or printed from any computer. I am an alum. Can I have a printable copy of my thesis? MIT theses that have been scanned and deposited into DSpace@MIT are openly accessible to anyone. You can print a copy for yourself. If you want to order a softbound copy, find your thesis in DSpace@MIT, click on the "Purchase paper copies of MIT theses" link to auto-populate our order form, and follow the ordering instructions below. If your thesis isn't in DSpace@MIT, fill out the order form. In the “notes” area, type “I am the author of this thesis.” Select “Other” as the payment type and type “Author” in the "Other information" box. Are all MIT theses collected by the MIT Libraries? All theses for advanced degrees are collected by the libraries, as well as selected bachelor’s theses. To see the thesis holdings, visit Barton, the MIT Libraries catalog. Are all MIT theses available in DSpace? New theses since the 2004 academic year are automatically scanned and are added to DSpace after cataloging and thesis processing is complete. Theses completed prior to 2004 are scanned on demand, and are only scanned if an individual or an institution has requested a paper or electronic copy of a particular thesis. Paper copies of theses are preserved by the Institute Archives and will continue to be the official MIT copies of record. Why isn't a certain thesis in the DSpace@MIT thesis collection? DSpace@MIT does not contain all MIT theses, only a selected group. All new theses since the 2004 academic year are automatically scanned and added to DSpace@MIT after cataloging and thesis processing is complete. Theses completed prior to 2004 are scanned on demand, and are only scanned if an individual or an institution has requested a copy of a particular thesis. All of the scanning of paper theses is done on a cost recovery basis, and the first person/institution to request a particular thesis is the one who pays the scanning cost. It is our goal to scan all of the theses completed at MIT for DSpace@MIT; however, more than 100,000 theses have been completed at MIT. The 44,000 theses in DSpace@MIT only represent a fraction of MIT's print thesis holdings. Anyone interested in accessing a printable PDF file or a paper copy of a thesis not already in DSpace@MIT should make a request through the MIT Thesis Order form, or contact Document Services at docs@mit.edu. Thesis authors receive discounted MIT-only pricing when requesting that their own thesis be scanned. More info is available on the theses pricing pages. Thesis authors who have an electronic copy of their own MIT thesis can add it to DSpace@MIT. See Add Your Thesis to DSpace@MIT for more information. Why am I being charged to have a thesis scanned? MIT remains committed to making theses publically available to the world. Regardless of whether copyright is held by the student or the Institute, the MIT Libraries publish theses electronically, allowing open access viewing. While there are fees charged for scanning, these fees are used to scan more theses and make them available for open viewing. Without these fees, only a very small subset of theses (those submitted electronically) would be available online. Why are some MIT theses available in color, while others are available only in black and white? All theses scanned since 2008 retain any color or grayscale content. Theses scanned prior to 2008 may be in black & white even though there was color content in the original. At the time they were digitized, color scanning was not economically feasible. Original paper versions of MIT theses are available for viewing in person in the Institute Archives, with 24-48 hours advance notice.